This is my take on the http://stamping411.blogspot.com/ challenge this week. My card details are cs: whisper white, so saffron and close to cocoa; ss: Beary Nice Wishes; dsp: delicate dots; ink: pacific point, so saffron and close to cocoa; accessories: Pawsitively embosslit and Lil Paws embossit and an argile texture folder. 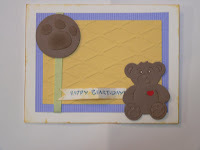 Love all the texture and the cute teddy! the paw print just finishes it off. Simply adorable!!! Love the details. Thanks for playing along this week with Stamping 411! Oh this is adorable! Great texture!